After years of inventory shortages, rising home prices and bidding wars, the number of homes on the market may finally be going up, according to Trulia’s latest Inventory and Price Watch Report. In the third quarter of 2018, total U.S. inventory fell just 2.5 percent year-over-year, the smallest such decline since the beginning of 2015. While there are still fewer homes for sale now than during the same period last year, inventory is actually climbing in certain cities and high-end housing markets. 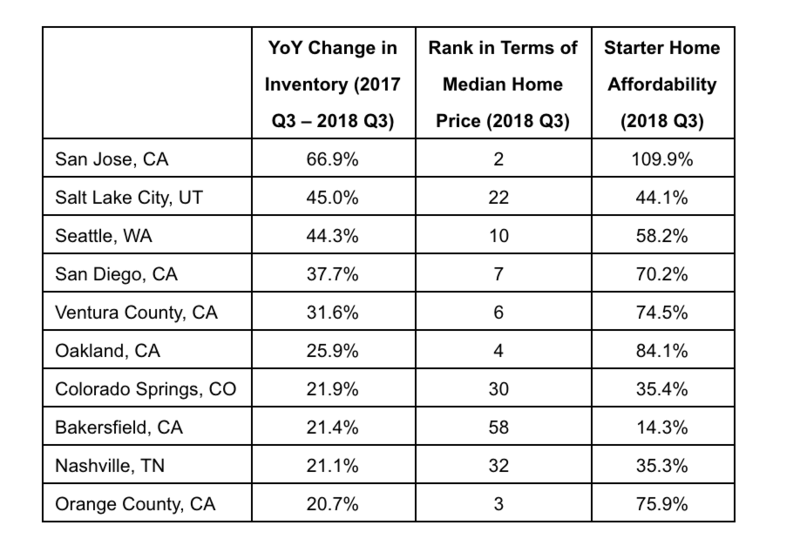 Six out of 10 cities with the largest inventory surges were in California, with San Jose, San Diego, Ventura County, Oakland and Bakersfield all experiencing increases of more than 20 percent. In San Jose, among the country’s priciest housing markets, the number of homes for sale rose by 66.9 percent. With a 45-percent increase, Salt Lake City notched the second biggest inventory boost and Seattle, with a 44.3 percent rise, snagged third place. But for those searching for a first home or hoping to downsize, the outlook isn’t as rosy. Competition for low-income and starter homes remains fierce, with the median list price for a starter home clocking in at $89,000, according to Trulia. Overall, starter homes make up the lowest percent of total available housing (20.9 percent) while typically requiring higher mortgage payments (25.6%) than trade-up (24.4%) and premium homes (21%). “Nonetheless, those buyers daunted by low inventory and high prices have reason to be cautiously optimistic as parts of the housing market begin to ease,” added Young .